For Easter this week, we explore how synchrotron radiation can be used to probe and find answers to a variety of scientific questions as we bring you a special programme of highlights from the Diamond Light Source podcast. We hear how changes to key proteins can cause hypertension and pre-eclampsia, how green rust could provide a greener future and discover a new type of magnetic material which could make data storage faster, cheaper and more compact. Plus, we explore a new form of solar cell which could make solar energy more affordable in the future. New insights into protein shape may provide novel treatments for serious diseases of the circulatory system, including high blood pressure and pre-eclampsia. with Robin Carroll, Emeritus Professor of Haematology from the University of Cambridge. New insights into protein shape may provide novel treatments for serious diseases of the circulatory system. High blood pressure, also called 'hypertension', is a major risk factor for cardiovascular disease in the UK, while 'pre-eclampsia' is a potentially life-threatening state of acutely raised blood pressure that affects pregnant women. Meera - Pre-eclampsia is unfortunately quite common, with 10 women and 1,000 babies dying from it in the UK every year. There are various factors in the mother that contribute to the disease, inducing pre-existing hypertension; heart rate; and also the constriction (narrowing) of blood vessels, which raises blood pressure. Robin Carrell from the University of Cambridge is looking into this latter cause, and he told me more about the proteins that are responsible for blood vessel constriction. Robin - A major factor is a peptide hormone called angiotensin which directly results in a tightening, or vasoconstriction, of small blood vessels. Angiotensin originates from a large protein that circulates in our blood called angiotensinogen. 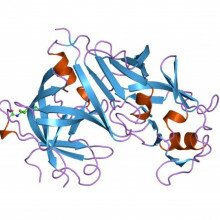 The hormone is released by an enzyme from the kidney called rennin, and the renin cleaves off the terminal part of this circulating protein angiotensinogen to give this very small peptide hormone, angiotensin. Meera - You've been looking at the actual structure of this angiotensinogen protein to see what happens to it to release angiotensin. Robin - The first and very satisfying finding is that angiotensinogen is far from being a passive source of the hormone. It interacts in a very active way with the enzyme renin. The cleavage site that renin acts to release angiotensin is buried within the angiotensinogen molecule and we demonstrated this, and were also able to demonstrate the way that the interaction with renin results in the cleavage site becoming accessible, changing from the interior of the molecule to the exterior of the molecule. So we're now seeing that angiotensinogen plays an active and positive part in what is the initiation of the main process of controlling blood pressure. Meera - What actually happens to it for it to become exposed? Robin - The surprise to us and to all was the presence of a 'hidden' switch, a fine tuning mechanism that controls the activity of the interaction between renin and angiotensinogen that release the hormone and this switch is based on a disulphide bond; a bond between 2 sulphurs. Now in the case of angiotensinogen, with this disulphide bond they are liable, or susceptible, to being broken as the molecule changes from an oxidising to a reducing environment. In a reducing environment, the bridge between the 2 sulphurs is broken and the two parts of the molecule can move apart. In an oxidising environment, the 2 sulphurs are bonded and held together and they hold the molecule in a more active shape, that is they more readily release the hormone angiotensinogen, that controls blood pressure. Meera - If the angiotensinogen is in an oxidised environment, does that mean it is therefore more exposed and therefore more likely to be cleaved by the renin and for the hormone to be released? Robin - That is right, that the molecule exists in two forms and they switch from one to another as the protein moves from a reducing environment to and oxidising environment. Meera - Why would taking a therapeutic approach using this early mechanism be better than current treatments for hypertension? Robin - It needs to be emphasised that what we're looking at is the initiating stage in the release of the hormone angiotensin. There is a second stage where the hormone is refined into the form that actually interacts with the arteries and this second stage is controlled by an enzyme for which there have now been designed a series of inhibitors, people may well know them as the ACE inhibitors, that are used very effectively to treat blood pressure. But the major problem is that ACE inhibitors are contraindicated, for very good reasons, in pregnancy. And it is in pregnancy that we get one of the greatest challenges for hypertension for people in the prime years of their life: pre-eclampsia, which affects 2-7% of all pregnancies. Pre-eclampsia is still not well understood, so what we've done is add a facet of understanding because we've shown specifically the change of angiotensin to the more active, oxidised form takes place in pre-eclampsia. It opens prospects for what was otherwise has been a very resistant condition. That is, the high blood pressure of pregnancy that is the accompanying and prime feature of pre-eclampsia. Meera - So I can imagine this has a great deal of benefits if it were to come into practice. So I guess, what actual stage is the research at now, how far away do you imagine we are from that being a therapeutic use? Robin - The quick answer is that now we're beginning to understand the mechanisms, it opens various approaches, theoretical and otherwise, to treatment and that could be many years ahead. But there's been an intensive effort made to look at therapies for hypertension and now as we look at the various treatments that have been tried or being given in trials in early stages, there are some that we feel might be relevant to the basic process that's occurring and we hope our findings will be an encouragement to these people and eventually pharmaceutical companies to follow this up. Meera - Robin Carroll, Emeritus Professor of Haematology from the University of Cambridge. Meera - Due to various factors such as UV in sunlight, our DNA is constantly being damaged and organisms need to repair that damage on a regular basis in order to survive. There are many proteins involved in this repair, one of which is XPD, a protein that Jim Naismith at the University of St Andrews has been looking into. Jim Naismith - The protein that we studied is called XPD; it's a type of protein called a helicase, which means it unwinds the DNA double helix around damaged regions. That's one of the very first steps in repairing DNA once it's been damaged. Meera - If this protein for any reason becomes dysfunctional, what are the consequences? Jim - In humans there are a number of diseases, the most famous, or infamous, is called Children of the Moon syndrome. These are children who have to be kept away from sunlight because they are unable to properly repair DNA damage. These children often develop cancers and fairly significant other illnesses. There's also other phenotypes [physical characteristics of the disease] to do with hair: you get brittle hair and you sometimes get deformities during development. Meera - So what are the malfunctions that happen in these proteins that result in them not working, what happens in these diseases? Jim - Well, you're unable to unwind the DNA and start the repair process. What we were able to show is that the mutations involved in one disease cluster in one particular part of the protein, while the mutations causing brittle hair cluster in a different section of the protein. 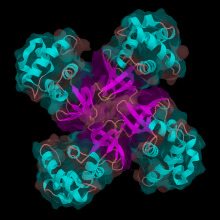 Meera - How have you set about looking at the structure of this XPD protein? Jim - Humans are quite similar to bugs called archaea. There are 3 trees of life if you like; so, bacteria tree of life; the eukaryotic tree of life, which is us, or we're in that tree, and then there's a third branch called Archaea. Eukarya and Archaea are diverged later than split from bacteria, so what that means is that we're actually quite similar in some ways to these archaea organisms and one of the easy in which we are similar is in DNA repair. Now the human enzyme is extraordinarily difficult to work on, it's longer, bigger. The archaeal equivalent of XPD is much more tractable to biophysical methods and so we were able to clone that, purify it, crystallize it and determine the structure at the Diamond synchrotron. But the key residues that are mutated in the human disease can be mapped very easily on to the structure of the archaeal organism and in fact you can test those by biochemical methods to see if you can recapitulate defects in the protein. Meera - So, having looked at the structure of this protein in the archaeal versions of the proteins, what have you found about the structure of this particular protein? Jim - We've found that one set of mutations are clustered in what is called the ratchet. Helicases work by breaking down a molecule called ATP to provide energy, like fuel, and as they do so they 'drag' a duplex of DNA over and break it up into separate strands. We showed that one set of mutations exert their effect by working in this region, which is actually at the interface between two parts of the protein. The other set of mutations are distant from that; they affect the ability of the helicase to recruit other proteins into the cluster. In all organisms, but especially in higher organisms, such a complicated thing as DNA repair often requires multiple proteins working together, and you get these multi-protein complexes. The other set of mutations cluster exactly where you would predict other proteins to 'dock' (join the complex). Quite different biochemical phenotypes; one will activate helicase activity; and the other one the helicase activity is normal, but it stops the helicase from recruiting other proteins essential for DNA repair. Meera - So there is a two-step process in this early stage of DNA repair? Jim - Yes, and if you have the inability to unwind the DNA, you get the very severe illness, the cancer, the Children of The Moon. If you have the ability to unwind the DNA, but not to bring other proteins to the party, you get the other very severe, but not quite as severe, diseases like Brittle Hair. Brittle Hair, you think 'Oh, I can just live with that' but there are actually a lot of abnormalities to go with that which are significant. Meera - So what has this structural insight provided in terms of really understanding the diseases? Jim - So what this structure enabled us to do is segregate why one set of mutations caused a particular disease and why another set caused an apparently totally different disease. So that wasn't known, they couldn't segregate them before but with the structure you can. The fact that one of the pathways only affects the recruitment of other proteins and leads to a more subtle though still serious illness may help us disentangle the pathways that go wrong in DNA repair. So these mutations may allow us to see what other mechanisms are involved in DNA repair and in so doing could help with understanding cancer, where faults in DNA repair are often implicated. Meera - Jim Naismith, Professor of chemical biology at the University of St Andrews. Paolo - Essentially multiferroics are materials that can be addressed using two different fields. Current materials can be read or written but just based on their magnetic properties. We already know by Einstein's theory of relativity that really magnetism and electricity are two manifestations of the same phenomenon; they can be interchanged with each other if you have an object that goes to speeds comparable to the speed of light and this is precisely the phenomenon that we are exploiting. We're trying to create materials that can be read and written electrically, which is a much more energy efficient and faster way to address materials, but that can also still hold information magnetically which is very efficient as well. Meera - What are the benefits of this then? Paolo - We can make electronic devices, in particular electronic storage as well as information processing devices that are smaller and consume less energy. We all know how annoying it is to have a laptop that runs out of battery or an i-pod that runs out of battery. Meera - Multiferroic materials are materials where magnetism or electronic fields can be applied in order to change the magnetic properties? Paolo - Exactly, so the idea here is that you can apply an electric field rather than a magnetic field and you can change the information state of a bit. Meera - Could you give some examples of multiferroics compounds or materials? Paolo - So multiferroics tend to be oxides, but they can be simple oxides or very complicated ones. Simple binary oxides have a single metal bound to oxygen, such as chromium oxide and iron oxides like common rust, or the black form of iron oxide called magnetite, which is also believed to have multiferroic properties. More complicated structures such as hexaferride has 4 or 5 different metals. They're still rather common placed materials, you can find them in fridge magnets if you want. Meera - So all of these materials you've mentioned, they vary with complexity, but they could all potentially have uses in things like data storage? Paolo - They can all have uses. First of all you have to understand how they work, and this is part of what we are trying to do at Diamond. Then you need to integrate them with current electronic devices; this is the big challenge particularly for applied research because you have to essentially put these different types of materials on a chip that normally only has silicon and silicon oxides. This is the big technological challenge. Meera - And so as you mentioned you're looking into some of the fundamentals of it to understand it a bit more, and a key issue seems to be the temperature that these multiferroics have to run at in order to induce changes in their properties. Paolo - Temperature is very much an issue, but we know that we already have materials that run at room temperature or even at higher temperatures. Things like chromium oxide, for example, have the properties at room temperature, though sometimes we also study materials in which these properties are displayed at very low temperatures. These materials are the first ones in which a new type of phenomenon, multiferroicity, is manifest, and they are the first models that we have to try to understand this phenomenon. This is why, for the moment, we focus on materials that only work at low temperatures. If we can crack the secret then we can ask our chemist colleagues to find the right combinations of elements so that then these materials will be able to work at room temperature. Meera - At Diamond you're using techniques such as X-ray scattering to look at the particular structures or arrangements. What have you been able to find out; what's been a recent discovery? Paolo - What we can do, for example, is directly see the changes in magnetic structure as we apply an electric field. The arrangement of the magnetic moments in the crystal sets up a tiny electric field, and as you move the internal polarisation of the crystal by an external force, then the spins follow. So you switch the spin system by applying an electric field, and this is the ultimate goal of what we are trying to do. If we could do that at room temperature in a material that is cheap and can be integrated into electronics then we will have reached the goal of our research. Meera - What could these materials be used for? Paolo - So we're hoping to use these materials to store information in a magnetic form and then to change the state of information say from zero to one in a bit, but rather than doing it by applying a magnetic field which is cumbersome and cannot be really scaled down to very, very tiny dimensions, we could apply an electric field which is much more localized and has very low energy consumption. So, when we put it into a device you could have a much more compact, faster and overall better system. Meera - Paolo Radaelli from the University of Oxford. A special type of rust, called 'green rust', could be used to scrub contaminants from the environment to make for a greener future. Sam Shaw from the University of Leeds has been using Diamond's beamlines to find out how rust could be used to benefit the environment. Sam - Green rust is very similar to rust. It's an iron [the chemical symbol for which is Fe] oxide phase and it gets its name simply from its colour, but it has a slightly different chemistry from normal rust. It contains both Fe(II) and Fe(III), the two different oxidation states of iron and that's what gives it its green colour. 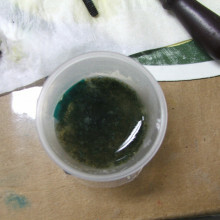 Fe(II) produces blue compounds, Fe(III) is yellow and if you mix them together you get green. But the special properties of green rust are that it is able to immobilise particular contaminants by changing their chemical state and thereby reducing their impact on the environment; this could potentially be applied to remediate contaminated land sites. Meera - What particular contaminants can it immobilise and where do you actually find green rust? Sam - Well in terms of the contaminants, there's a wide range of inorganic contaminants from Chromium, which is a particular problem across the world. There was an industrial legacy of Chromium smelting in Europe and America which has left a lot of chromium waste. Also radionucleides like uranium, technetium, which are potentially hazardous, for example leaking from a nuclear waste repository, but also organic contaminants, for example trichloroethylene which is a widely distributed contaminant. In terms of where you get it in nature, it is extremely rare. Because it contains this Fe(II) component, it's very sensitive to air oxidation so while you might dig in the soil and find some green patches they will quickly turn brown as the Fe(II) is oxidized to Fe(III). This is one of the challenges of studying green rust; we have to mimic the conditions where it occurs by having very low oxygen levels to prevent oxidation. 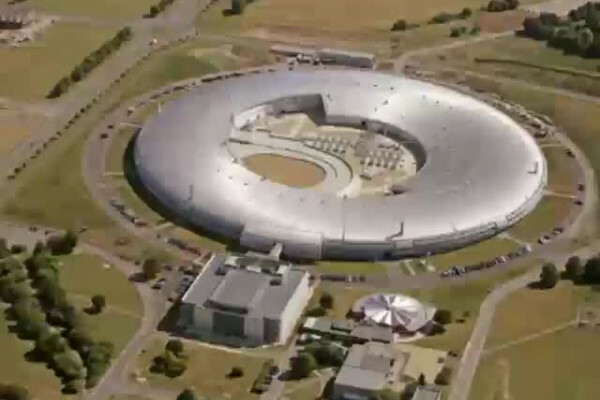 That is what we've been doing on the synchrotron. Meera - So how do you set about recreating these conditions and then looking at the reactions of green rust here at the synchrotron? Sam - Well what we've done is develop a reaction cell which can mimic the conditions of green rust formation in, say, a soil or potentially in a contaminated land site. To mimic the pH, the acidity or the alkaline nature of the solution and also the redox potential, so how oxidising or how reducing the environment is, so that's really controlled by how much oxygen is present in the system. By doing this, we can synthesise and form the green rust. Then, by flowing the solution containing the green rust as it forms through a capillary which is mounted on the synchrotron beam, we can characterise the formation reaction and the process by which the molecular structure of green rust is built. Meera - So what is the structure of green rust and what have you been able to see about how it actually immobilises various contaminants? Meera - So knowing this information, how could these contaminants be treated or immobilised? It seems green rust can only exist in very limited conditions, so given that, how is it then possible to create it to then decontaminate land? Sam - That's a very good question and what we've learned using the synchrotron, is that we've really understood the geo-chemical conditions in which green rust is stable and from this we've been able to develop key formulations and recipes of green rust which we're beginning to use to immobilise particular contaminants. But it's true, the sensitive nature of the rust is a problem and we have gone some way to stabilising the green rust, but the future work we're doing will be to develop a more stable form with wider applications for the green rust materials. Meera - Sam Shaw from the University of Leeds showing how understanding the science of rust on the nano-scale can help our environment on the global scale. A new form of solar cell that uses plastic instead of silicone may make solar panels a cheap and effective way of producing electricity. David Lidzey - The materials that we are interested in are very special plastics so they have been synthesized for us by synthetic chemists here at Sheffield. They've got two really important properties; firstly they absorb light over a broad range of wavelengths, so where you might see a film of polythene which is largely transparent, the materials that we have can absorb light all the way from green wavelengths right the way through to the near infrared, and of course if you want to harvest sunlight energy you want to pick up as much of the sunlight as possible. So that's one property which is important. 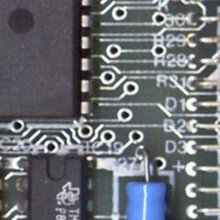 The second property is that they are electrical semi-conductors; so basically once you put a charge carrier, like an electron for example, in these materials, the charge will flow through the material if you apply a field to it. So, the photovoltaics are made from these thin films of semiconductors and essentially we have our plastic which is mixed with another material which is called a Fullerene. Fullerene is basically carbon-60, so this is a molecule which was discovered 20 years ago or so. It's one of the pure forms of carbon. Meera - So how would this actually work? I assume it's reasonably new, you're always looking to use plastic and people haven't up to now, so what are the challenges really faced with using this as a material? David - Well there are a number of challenges. One is extending the red absorption wave length, so we want to go further and further into the infrared, and the second challenge is actually getting these charges out of the thin films. So basically you have this Fullerene molecule and when the polymer is excited by the absorption of a photon, an electron jumps from the polymer molecule to the Fullerene molecule and this act of what's called 'charge transfer' essentially creates a tiny current inside the device. When that happens over millions and millions of molecules, we can extract enough of a current out of the device because of this charge transfer process. The problem is though, when we take our polymer and we mix it with the fullerene molecule, the polymer and the fullerene phase separate. You've seen a salad dressing made by the mixture of oil and vinegar and of course the oil and vinegar separate; when we mix the polymer and the fullerene together, they'll also phase separate in a similar way. Now this is beneficial for us because we want to create parts of the film which are polymer-rich and other parts of the film which are fullerene-rich, and these almost create little charge-transfer wire inside the material. If they actually phase separate on too large a length scale, then this makes the device not work very efficiently. If it phase separates on a very fine length scale then they also don't work very efficiently because you can't form these little charge-transfer pathways. So essentially one of the tricks is to actually know how to get the film to phase separate on exactly the right length scale and this is one of the things that we've been very interested in. And we've been using the Diamond Light Source and other techniques to actually study the structure of the film. Meera - What has this enabled you to see then in detail about the process? David - Now what we find is that for most of the time when this solution is drying, actually nothing much happens at all. I guess this is a sort of 'watching the paint dry' phase. But when the solvent evaporates to leave only about 50% of the film containing solvent, things suddenly get very exciting. What happens is we see a very rapid crystallization of the polymer. This process happens in about 5-10 seconds and suddenly we see that as the polymer molecules start to crystallize, it's very difficult for the solvent to leave the film. The kinetics of the crystallization of the polymer tells us that the crystals first form around impurities, or little aggregates, that exist within the film and we see a crystallization that happens essentially in one dimension. So we see a one-dimensional crystallization of the polymer. And thirdly, we actually find that as the polymer crystallizes, we can see that the crystallization and the arrangement of the molecules in the crystallites improves, basically their packing gets tighter and tighter, there's a general reduction in kinks and twists in the molecules. So it's really the whole picture, the way that the solvent evaporates, the dynamics of the crystallization, and the improved packing of the molecules. It gives us an overall picture of the processes that occur as the film dries. Meera - So having been able to see this; what stage would you say your research is at the moment? 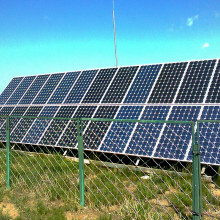 Have you got a final design that you would want to go into production to have plastic incorporated into our solar cells? David - Well at the moment the sort of solar cells that we are producing here at Sheffield, and that other groups are producing around the world, have efficiency between 4 and 8%. So this means that between 4 and 8% of the sun's energy that is absorbed by the solar cell is actually converted into electrical power. Silicone, our big rival as it were, has an efficiency of between 15 and 20%, so you can see that we're actually quite far behind silicone really. So one of the big challenges now is to improve the efficiency of the organic based system up towards the efficiencies of the inorganic based systems. It is possible that we will never actually get to the efficiencies that you get with the inorganic, but the big advantage of using polymers is that they are very cheap to produce and make thin films from. Meera - So although it may not match the efficiency of silicone, the fact that it's cheaper will hopefully mean that more places and more people will be using it? David - Well exactly. The idea is that if you could produce these things on a plastic substrate then essentially you could go down to you local DIY Supermarket and buy a big roll of this stuff and just pin it to your side of your house and produce your electricity very, very cheaply. And really there's a huge amount of land area which is redundant in parts of the country, like the roofs of out-of-town supermarkets or the sides of railways or motorways. You don't want to do very much with these places and if you could actually cover them at very low cost with a thin, flexible photovoltaic film, you could produce a huge amount of electricity. Meera - David Lidzey from the University of Sheffield.